As a nurse, mom was already very familiar with hospice care agencies. They often attended her patients in the hospital and she understood the great value they offered. However, most of the family was understandably shaken when she started talking about interviewing hospice providers. We were upset, and confused by the common misconception that hospice is only for those who have given up, for the dying. We couldn’t, or wouldn’t accept that mom had given up. And mom hadn’t given up. She was just being realistic. She understood that the course of her pancreatic cancer would almost certainly bring her to death’s door at some future point, and she wanted to be ready. She also wanted her family to be ready. She knew that hospice care would provide the tools to prepare us. And so, after months of conversation, research, and perseverance on mom’s part, we all began to finally get the purpose of hospice. May I share with you what we’ve learned? We no longer view hospice as a necessary evil for when the time comes, but as a vital way to help mom live until she dies. 2)	That their remaining time should be as peaceful and comfortable as possible. It involves a team-oriented approach to provide expert medical care, pain management, and emotional and spiritual support for the dying person and their family. The care is expressly tailored to the person’s needs and wishes. This level of support is hospice’s greatest gift to the family. I have come to understand that those who work in the hospice care field are individuals full of compassion. They approach their work with great empathy and understanding, as they help to ease the transition from life through death. Most hospice professionals are asked about their somber choice of career. It must seem depressing to many. The following excerpt is from the book Final Gifts and is a beautiful answer to the question, Why do you do this work? That’s a hard question to answer. The sadness and tragedy of somebody’s dying is always there – I feel it, too. But beyond that is an opportunity for me to help a patient cherish the final chapter of her life, to use this time to resolve issues, say important things, finish unfinished business, and share important moments with people she cares about. My job is to keep my patients as comfortable as possible, so they can do those things and use this special time the best way they can. I also feel strongly that, like birthing, dying can be an opportunity for the whole family to share positive experiences, rather than only sadness, pain, and loss. That is the challenge of this work, and that’s the joy for me. Mom knows that the final days of her fight with pancreatic cancer will be difficult to say the least. We’re not there yet, and God willing it will be many years, but when the time does come, she has chosen hospice care to shepherd her through those last days. 2)	A patient can stop hospice care at any time should a new treatment become available that he/she wishes to try. You are not locked in to hospice by signing a contract. 3)	Hospice care can take place in your home (the most common), the hospital, nursing home, long-term care facility or even inpatient hospice homes. This last one, hospice homes, is still fairly rare, but is becoming more common as hospice care enters mainstream status here in the states. 4)	Patients seeking hospice care early (months to go), rather than late (weeks to go) usually see an increase in their remaining quality of life. Hospice has developed wonderful strategies to alleviate so many concerns that affect late stage pancreatic cancer patients. Many patients often find tremendous relief once they turn to hospice care. 5)	Hospice staff is trained to deal with all the symptoms a patient may undergo as their illness progresses. From pain to fatigue, nausea to constipation, you will find that a system of care will be tailored to your specific needs. 6)	Hospice staff are also trained to deal with the difficult emotional, spiritual and relational issues that are so often overwhelming during this time. Family counselors, social workers, and even chaplains are available to help address any concerns. 7)	And finally, Hospice will do as much or as little as you, the patient, and your family wants. You are, and always will be, in control. 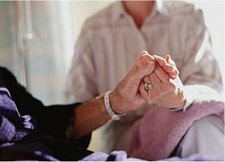 Hospice is only there for support, encouragement and care, allowing you the honor and dignity to approach your death in the manner you choose. 1)	Are you accreditated/certified/licensed? In other words, are you the real deal or do we need to check the Better Business Bureau? But seriously, if we are going to have nurses, therapists, social workers and such, coming in to mom’s home, we want to make sure they are legitimate, licensed and bonded! One other note: If the hospice program is Medicare certified then you know they have met the minimum federal requirements for patient care. 2)	Can you provide us with some references? And, yes, we will call and visit with them about their experiences. 3)	What types of services do you offer? The obvious is nursing care, but what about therapy, social workers, dietary help, family counselors, spiritual guidance, medical equipment? And does your agency require a designated family primary caregiver as a condition of admission (some do), and if so, what is expected of the family caregiver? 4)	What is your philosophy on managing the pain as the cancer progresses? This should really be question #1 – it is just that important! 5)	Are you available around the clock? Who do we call after hours? Middle of the night? Getting sick is never convenient, we want a hospice provider who is willing to be there when we need them the most. 7)	And lastly, what do you see your role as hospice provider to be for the terminally ill patient (mom) and her family (us)? This last question will probably be the most crucial. Finding a hospice team that is compassionate and believes in giving mom the tools to handle the end of her life with grace and dignity is so important to us. We will be vulnerable and grieving as mom enters this last chapter of her life, and we believe that having an understanding, supportive team to lean on during this time will be essential. As our Pancreatic Cancer Journey progresses, there will be updates to the Hospice Care issue. Mom is still seeking aggressive treatment to battle the cancer, and so far, it has been successful. We are not ready yet for end of life care. But, she is forever the realist and wants to be prepared for all contingencies, especially the MayDay call she may one day hear that it is time to abandon ship. Hospice Care will guide us through the pain, chaos and grief into what we hope and pray will be blessed peace and comfort.